Damaged Garage Door? Repair It With Aaron Overhead Doors! 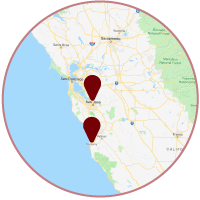 If you need any sort of repairs done to your garage door, Aaron Overhead Doors is happy to help in both San Jose and Monterey, California. Having a reliable garage door system is vital for so many people on a daily basis, and we understand how much it can mess with your day when you’re having issues with it. We offer full repair services no matter what the source of the problem is, and you can depend on our qualified technicians any day of the week. If you have damaged or broken hinges, we can repair such an issue in no time. Hinges often suffer wear and tear depending on how frequently you open and close your garage door, so some readjustment is often necessary to get your garage door operating as it should. This issue is a routine repair that we’d be happy to help with. Panel repair and replacement can occur due to various reasons, but we can tackle any issue that may exist in this area. For more information on panel repair and replacement, click here. A malfunctioning cable in your garage door system is something you can’t ignore. Only a thorough inspection can confirm whether or not the cable is the problem, so don’t delay if you’re noticing things like your door lowering too quickly or if the door is sticking while opening or closing. Common signs that your springs are broken could be the system being generally inoperable or it being constantly stuck open. In general, if your garage door isn’t working like it has in the past, call us at Aaron Overhead Doors. It is so important to have a professional do the repairs and replacement, give Aaron Overhead Doors a call to speak with one of our qualified and professional technicians today!